Please join us this Sunday from 12p.m. to 2p.m. to rally outside Folsom Priosn and show that we support prisoners’ efforts to strike for humane treatment. Please share the Facebook event, continue to contact prison officials, and look out for details like carpools, rally schedule, etc. On May 25th, prisoners in Folsom State Prison B4 ASU (Administrative Segregation Unit) began a hunger strike to peacefully protest the inhumane conditions of their confinement in the administrative segregation unit. Prisoners have exhausted all reasonable remedies and have attempted to open lines of communication with administrative officials, and have been met with only resistance, silence, and now retaliation. We cannot say exactly how many people are refusing meals, but we know that there are roughly 30 people in the unit that announced the strike. 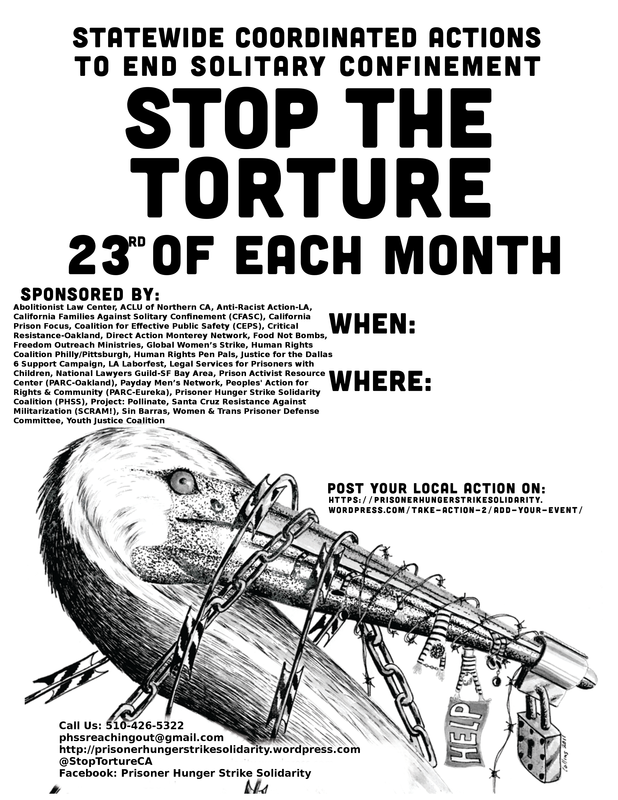 Mon, Dec 28 Rally in San Francisco: STOP SLEEP DEPRIVATION TORTURE at PELICAN BAY! Share the Facebook event and invite your friends! 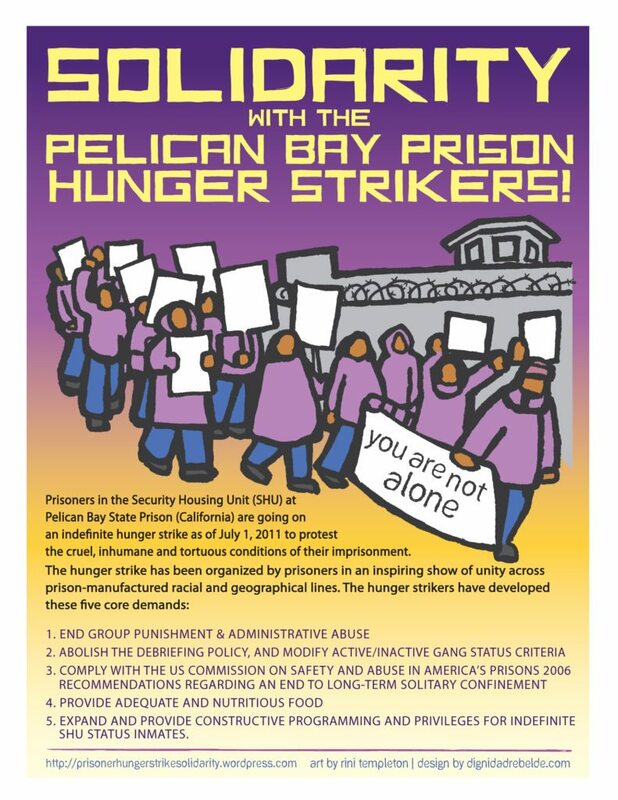 Join the Prisoner Hunger Strike Solidarity Coalition on Monday, December 28th outside the San Francisco Federal Courthouse (450 Golden Gate Ave, San Francisco, CA 94102) for a rally against the so-called “welfare checks,“ that since August 2nd, have been waking up men in Pelican Bay SHU (solitary confinement) every 20-30 minutes, 24/7. As of December 28th, these men will have been tortured with sleep deprivation for 148 days! Lawyers and CDCr officials will be meeting inside SF Federal Court at 11:00am. We want to show them that these checks are TORTURE and that they need to STOP NOW! We know that interrupted sleep can cause serious mental and physical health problems. John R. Martinez, who has been in Pelican Bay SHU for over a decade, …wrote: “…there is a reasonable probability that life-threatening injuries and/or even death is inevitable, as medical symptoms are only worsening but not being treated.” CDCr claims the checks are to prevent suicide, but knowing these detrimental effects of sleep deprivation, we’re worried the checks could actually lead to someone committing suicide or developing permanent disabling, and potentially terminal illnesses and conditions. 1. Call to advocate for the 30 minute checks to stop, stating that sleep deprivation is torture. Some offices may require your name, city, and zip code. 2. Forward this information to your networks to make it known widely that this torture may continue unless we, along with allied lawyers, put pressure to stop it! Following the historic gains made against solitary confinement last month, people in Pelican Bay State Prison’s SHU report the use of “welfare” or “suicide” checks occurring every thirty minutes, 48 times a day. The checks are being conducted in an aggressive way and prevent people from sleeping for over thirty minutes at a time. Loud stomping, the slamming of doors, the striking of electronic wands against buttons installed by cell doors, and the shining of lights into prisoners’ faces are routine. Deprivation of sleep is widely seen as a form of torture. 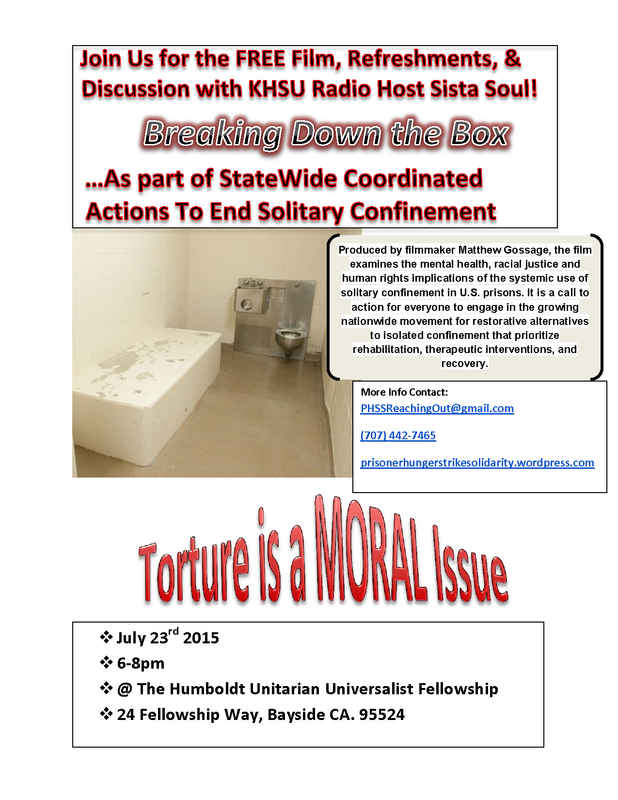 CRESCENT CITY – Civil rights issues regarding solitary confinement in state prisons are an ongoing concern. Wednesday a new issue was protested at Pelican Bay State Prison. …. Pelican Bay State Prison was among several sites across the country to see coordinated demonstrations Wednesday protesting solitary confinement. Lawyers, activists, and family members gathered outside Crescent City’s state supermax prison to protest a recently implemented Inmate Welfare Check System …. ⇒⇒ Demand that the noisy, aggressive checks stop. Check out our updated Universal Handbill to give out at these actions! 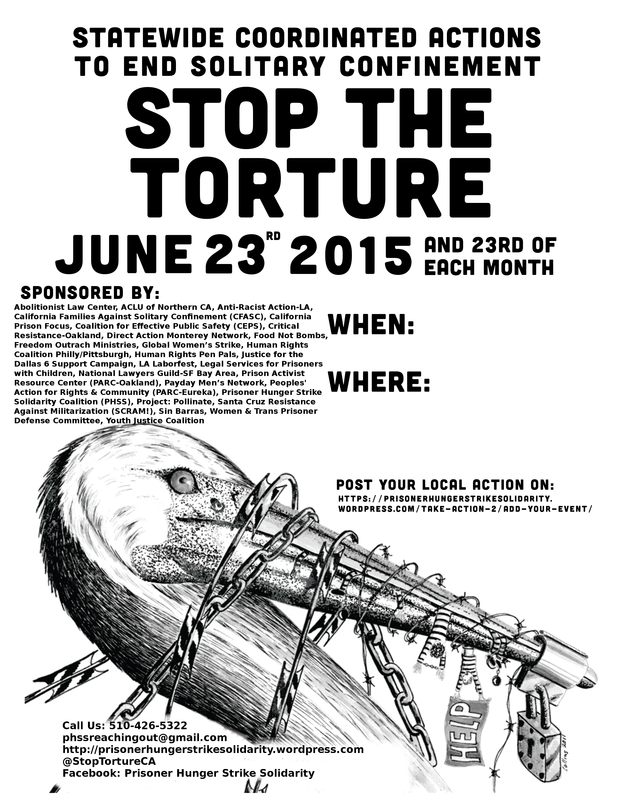 All are welcome to join this monthly demonstration against the torture of solitary confinement. 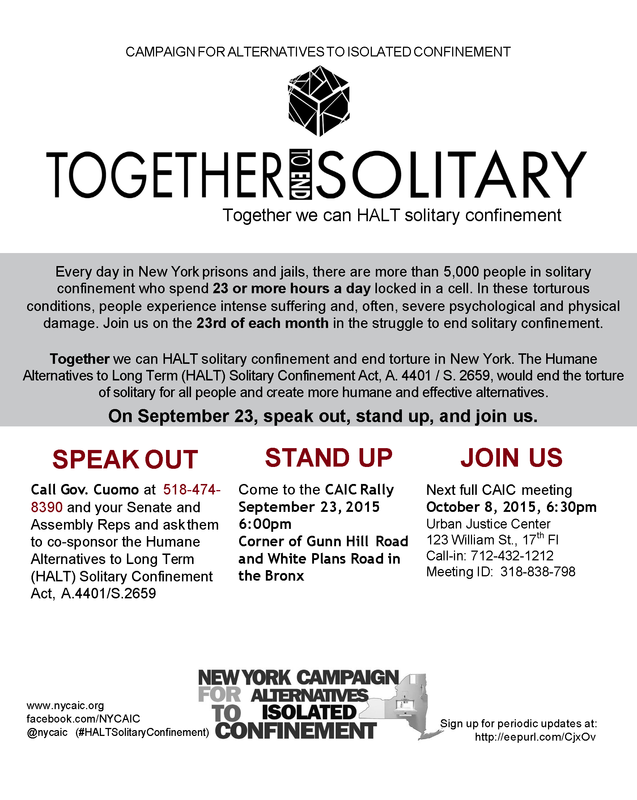 New York Campaign for Alternatives to Isolated Confinement (CAIC) asks you to lend support to abolish Solitary Confinement in New York State. Please join us on Wednesday, Sept 23rd to protest the sleep deprivation torture that began on the night of Aug 2nd in Pelican Bay SHU, perpetrated by the guards. People in SHU cannot escape the constant noise, and they can’t sleep. It’s torture and it’s really hurting them. We plan to set up across from Pelican Bay in protest of the 30 minute so-called welfare checks, the guards’ bogus excuse for the sleep deprivation. These “checks” happen 48 times a day, keeping people in SHU sleep deprived DAY & NIGHT. The men inside will learn of our solidarity action which, we hope, will lift their spirits. We will leave for Crescent City from Eureka on Wednesday morning and come back in the evening. Also, we will be demonstrating against CA prisons entombing people in solitary confinement, period. 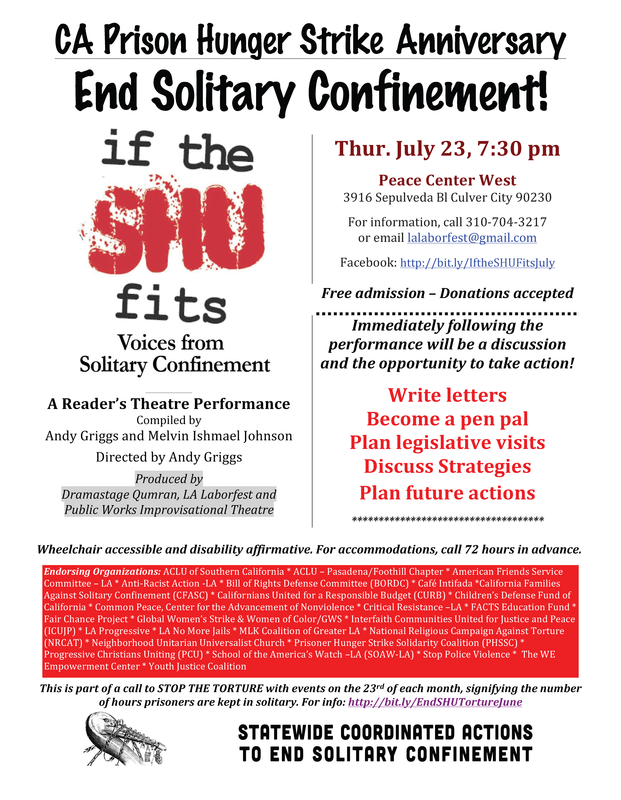 If the SHU Fits – Sept 23 Voices to End Solitary Confinement If the SHU Fits – Voices from Solitary Confinement is a play which uses the history, use of, and statistics about solitary confinement in the United States to paint a broad picture of the practice. But the heart of the play comes from letters, articles, statements, stories and commentaries from those imprisoned and their family members, as well as legal and community testimony.On Sept 1, 2015 an historic legal settlement was announced between CA and prisoners held in isolation for 10 years or more at Pelican Bay State Prison, calling for the end of the use of solitary confinement for people based on alleged prison gang affiliation. 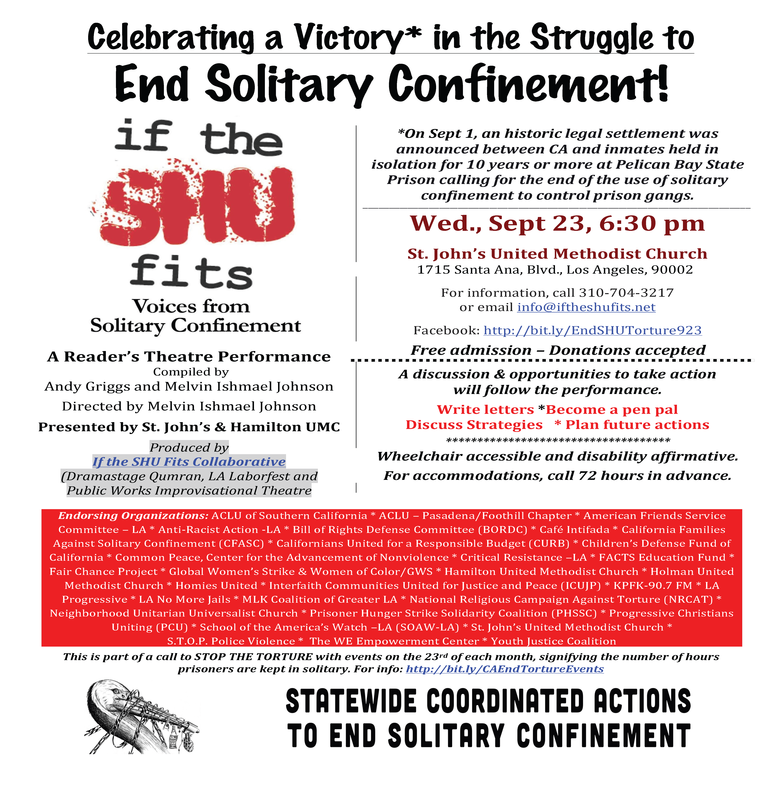 Despite that, the struggle is not over.Come join us to learn more about the ongoing efforts to end solitary confinement and to take action yourself! HERE‘s the Los Angeles flier! T’ruah: The Rabbinic Call for Human Rights is asking people to dedicate their fast for Yom Kippur (which is on Sept. 23rd) to people in solitary and to educate themselves. Unfortunately, for many people in America, being alone–continuously–is a daily reality. Between 80,000 and 100,000 incarcerated persons in solitary confinement are alone for 23 hours a day. In support with those who face isolation, activists around the country have dedicated the 23rd of every month as a day of action and solidarity. This month, the 23rd is Yom Kippur. T’ruah is calling on Jews across the country to dedicate their fast to those who suffer in prolonged solitary confinement and renew their commitment to ending it. The big banner and new placards will put attention on the horrendous noise at Pelican Bay SHU 24/7, caused by the ‘wellness checks’. The architecture of the SHU at Pelican Bay amplifies the slamming of the pod doors, the guards clambering up and down the tiers as well as the beeper and wand action by guards. The interpretation of these wellness checks by Pelican Bay staffers is unacceptable. Turn out to hear the latest and sign up for our emergency response network. Flying Over Walls will be hosting their Oakland LGBTQ+ Prisoner Letterwriting Nightagain in conjunction with Statewide Coordinated Actions To End Solitary Confinement – and discussing the recent Ashker v. Governor of California settlement, including what it means and what we are still fighting for. As the SF Bay Area chapter of Black & Pink, our focus is to connect the non-incarcerated LGBTQ+ folks who participate in our events to B&P members in Northern California prisons. We will be out talking with people and providing information to END SOLITARY CONFINEMENT and promote the AGREEMENT TO END HOSTILITIES. Please come join us for an hour after the work day. •Readers’ Theater: plaintiffs’ statement on the settlement of Ashker v. Governor of California; women in and against solitary confinement. On September 1, 2015 a landmark settlement ended indeterminate long-term solitary confinement in California prisons. The settlement may release 2,000 prisoners from solitary confinement. Let’s keep up the pressure to make sure it is implemented, and to end solitary confinement (15 days is torture), abusive prison conditions, and mass incarceration of the poor, particularly communities of color. 90% of people in the SHU in CA are people of color. Sept. 5, 2015 is the 2-year anniversary of the suspension of the third nonviolent CA Prisoner Hunger Strike and work stoppage by over 30,000 prisoners. It was based on 5 Core Human Rights Demands and the Agreement to End Hostilities between all racial/ethnic and geographic groups in CA prisons, jails, and communities. The most recent hunger strike for the Five Demands lasted from July 8, 2013 to September 5, 2013 — 59 days — and involved over 30,000 people locked in CA prisons, as well as hundreds of other prisoners, young and old, throughout the United States. 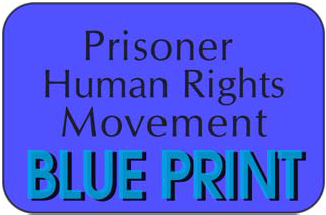 It was the largest hunger strike in history and brought the issue of solitary confinement to the attention of the media, legislators, the United Nations, and the public in general, resulting in legislative hearings, proposed (but failed) legislation, media attention, and solidarity actions both nationally and internationally. In California, we have changed the date to the 24th of every month. We no longer do this action on the 23rd of every month. (Handbills are updated, but below flier will be soon). 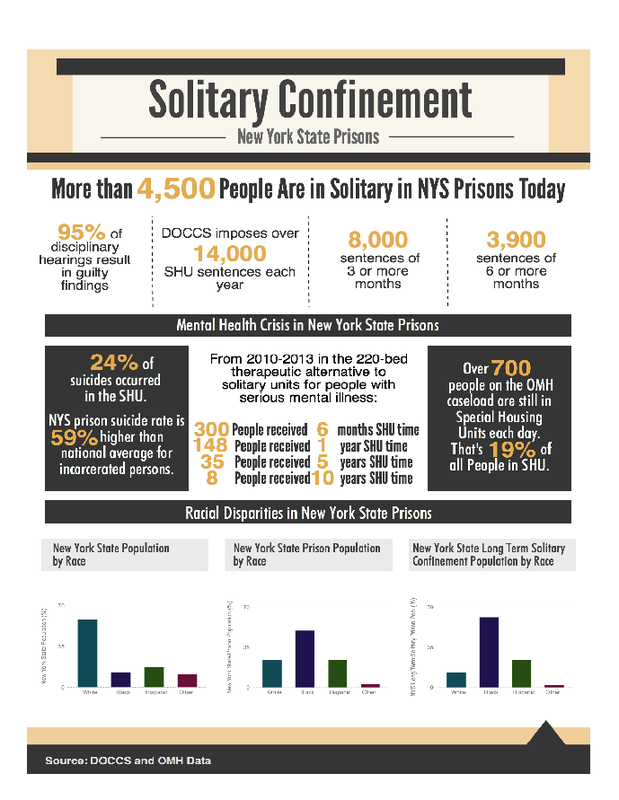 The Prisoner Hunger Strike Solidarity Coalition (PHSS) has helped launch Statewide Coordinated Actions To End Solitary Confinement (SCATESC) which began in strength, Monday, March 23, 2015. Actions will happen on the 24th of each month. This date emphasizes the 24 hours each day that people are kept in solitary confinement. These coordinated actions will acknowledge the importance of organized, community-based pressure as a core strategy (along with courts and legislators) of our work outside the walls to end solitary confinement. co-sponsor: help plan statewide, national, international, and local actions; do outreach, attend, and/or speak out. Please let us know at phssoutreach@gmail.com if you will endorse or what you will do to co-sponsor, and describe action(s) in your locale. If you want to be part of the Outreach Group organizing this effort, please email Verbena and Willow. Each locale participating in the Statewide Coordinated Actions will decide their locations and the time of day/night. We suggest places and times where and when there are plenty of people so that the actions are visible, and we can reach people with leaflets/information. If people-heavy locations also happen to be strategic for other reasons (e.g., a CDCR parole office in a busy area), all the better. Details about 23rd Actions in your locale (i.e. L.A., Oakland, San Jose) will be posted as we receive the information from various locales. HERE are the locations & details for June 23, 2015. HERE is June’s flier! Also, there are handouts that can be used by everyone for these actions. PHSS can send out packets of these fliers and handbills by request at phssoutreach@gmail.com (beginning April 2015). Here they are for download. Local groups can hand out additional literature, as well. These actions will help keep hidden torture in the public eye, build the movement to end solitary confinement, and serve as one way to update people as to the conditions inside and about the needs and goings-on in this human rights struggle. Organizations outside of CA and outside of the US are already joining and supporting this effort. The courage that prisoners continue to demonstrate—after leading two hunger strikes in 2011 and a third, the largest hunger strike in history in 2013– while upholding their Agreement To End Hostilities across racial lines should give us all the strength to organize in our own communities. Fight for Lifers West, Inc. Actions are planned in CA from San Diego to Arcata (including San Diego, Los Angeles, San Jose, Oakland,Santa Cruz, Arcata…); also, nationwide and internationally. There is a universal flier for all actions, with a space for each area to insert local logistics. Also, there are handouts that can be used by everyone for these actions. PHSS can send out packets of these fliers and handbills by request at phssoutreach@gmail.com (beginning April 2015). Local groups can hand out additional literature, as well.